Although I've found myself shopping at locally owned grocery stores more and more recently--more on that later--I still stop by Kroger once or twice a week. Kroger is where I buy the majority of our gluten free luxury items like bread and waffles, and it's where I usually get the best price on lactose free milk and pre-made hummus. My favorite part of shopping at Kroger, though, is the manager's specials. If you know where to look and what to look for, you can find some real bargains. First, I explore the produce department. Our store, and I assume many others, has a "reduced prices" rack. 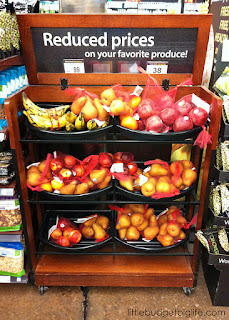 Any produce that's considered misshapen, undersize, oversize, or overripe is bagged up and placed here. These bags sell for $0.99 apiece. Sure, some of it may appear a bit questionable at times; don't buy that. But often, I find several days or a week's worth of fresh produce here for a fraction of the cost of the rest of the department. After checking here, I walk the perimeter of the produce department, specifically checking the coolers, looking for "woohoo!" tags. These typically signify a 50% savings on pre-cut, pre-washed, and prepared produce items including fruit and veggie trays, fresh salsas, and salads. Second, I cruise the meat department. Meats that are marked to sell quickly are not localized, but rather spread throughout the coolers. I scan the section as I'm walking, again, looking for "woohoo!" stickers. In our store, this extends along the back wall from fresh seafood to packaged breakfast meats, with fresh and packaged beef, poultry, and pork in between. It's rare that I find nothing marked down and worth taking home to cook or freeze within the next day or two. Third, I scope out the dairy department. I don't find too many "woohoo!" items here that we actually eat, but I always check. Milk, yogurt, and eggs are occasionally priced to move. Fourth, I head to the bakery and deli. There's a special rack for marked-down baked goods--which I check for Chris--and then I check through the coolers. Hummus, salsa, specialty cheeses, and fancy lunch meats are stocked in this area, and we consume all of that. Especially when I find a deal on it. Finally, I swing through the clearance table and aisle. Sometimes our store has a table set up near the self-checkout area, and other times the "Great Deal" dry goods are in the laundry detergent aisle. But either way, I stop by and see if there are any canned or boxed goods that we use, marked down. I can be through the store in 20 minutes when I focus on these key areas, and purchase quality groceries for a fraction of their regular cost. When I get home with everything, I make my meal plan based on what fresh items I've got and what is already in the pantry. Do you shop at more than one grocery store? 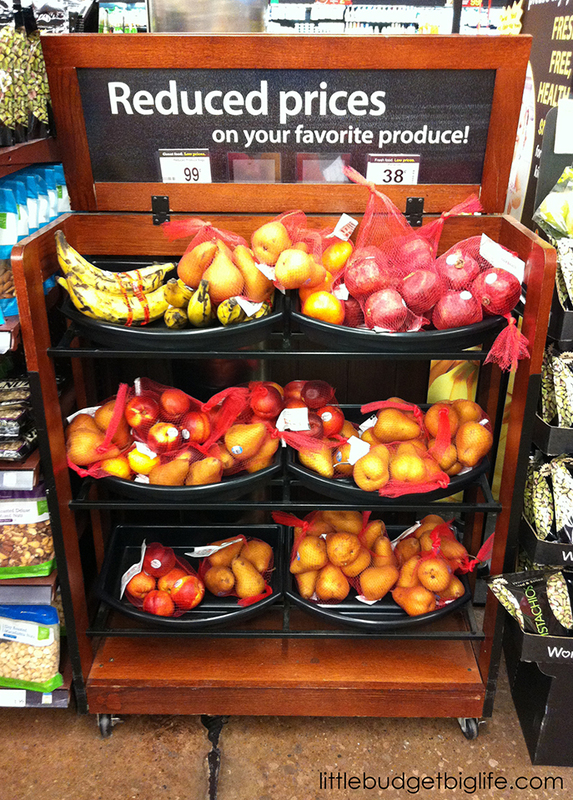 I'd love to hear how you stretch your grocery budget! Great suggestions! We have King Soopers here, which is part of the Kroger family, and I do a lot of the similar sweep throughs that you mentioned. I have found tons of deals in the meat department at the one close to us and luckily they put all the "deal meat" in one section of the case. This was not something I thought of doing much a year or so ago because we never seemed to have the space, but getting a deep freeze really allows me to save money and stock up on freezable staples. 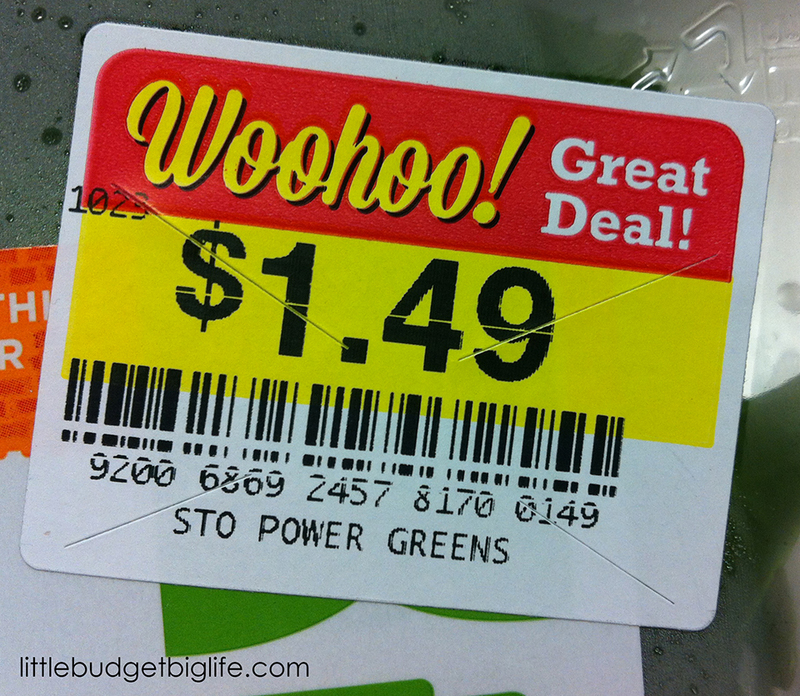 I do need to get better about looking over the reduced price produce. One of my goals for the fall/winter is to try my hand at making more soups and I think the not-so-pretty produce would be a great way to save a few extra bucks and also make meals in bulk.